Getting the realism into certain HMAF action figures was achieved by using real life action heroes. Digital sculpts were taken of several serving HM Armed Forces personnel. The picture above shows real life RAF Winchman Sergeant Ed Griffiths holding his action figure counterpart. Ed is more usually found swinging from a rope below a Sea King helicopter operating from his base in RAF Valley in Wales (C Flight 22 Squadron). 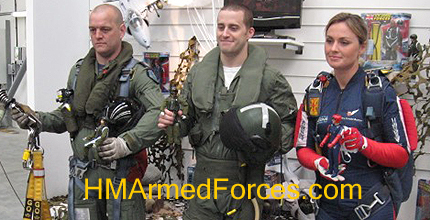 The HMAF Fast Jet Pilot is modelled on the real RAF Fast Jet Pilot Zane Zennet. The figure in the picture is held by Flight Lieutenant Jonathan Smith, Tornado F3 pilot from 43 Squadron, RAF Leuchars. And the RAF Falcon figure is of the real life RAF Falcons instructor Tony Brookes. Pictured above, the Falcon figure is held by serving RAF Falcon Flight Lieutenant Louise Buxton, Team Leader of the RAF Falcons Parachute Display Team. In the world of military action figures you can’t get much more real than that!